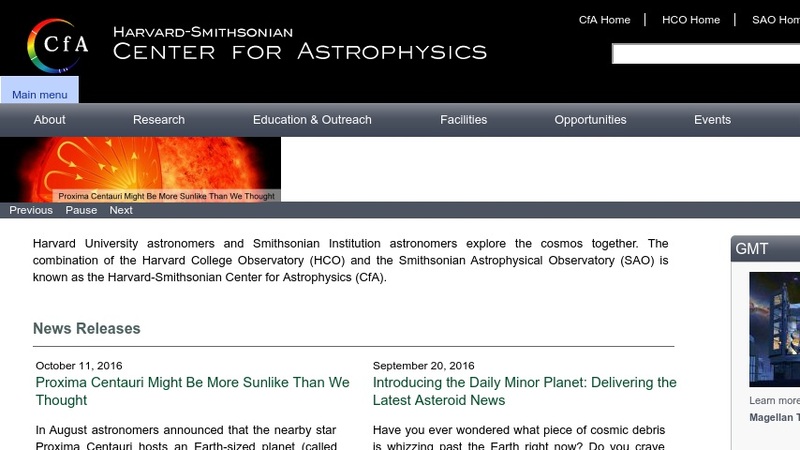 The Harvard-Smithsonian Center for Astrophysics (CfA) combines the resources and research facilities of the Harvard College Observatory and the Smithsonian Astrophysical Observatory to pursue studies of those basic physical processes that determine the nature and evolution of the university. The site provides information on the organization's research activities, grouped into six topic areas: the solar system; stars, planets, and origins; galaxies; cosmology; laboratory astrophysics; and extreme astrophysics. The education and outreach page includes links to professional development materials, curriculum materials, and information on informal education programs and education research projects. Other materials include an image gallery, an almanac on the current night sky, and information on four strategic science themes selected by CfA for concentration of expertise and investments: cosmology, galaxies, stars and planets, and extreme astrophysics.